It was very early on Saturday morning when we departed for Brighton and we’d reached Sunday, just, by the time we returned to Burnley, but we returned with another away point, a record breaking away point at that, from a 0-0 draw and, prior to today’s games we sit fifth in the Premier League table with only one pre-Christmas game to come. This certainly wasn’t the best game we’ve been involved in this season, of that there is no doubt, but this was a game, performance and result that for much of last season we could only really dream of on the road. I’m not suggesting we are expecting results away from home now but only two defeats from the first nine away games tells its own story and we can now add a new Premier League record with 15 away points beating our previous best of 14 in 2014/15. Our trip involved car and three trains and everything went pretty much to plan apart from the frustrating long queues at the station in Brighton waiting for the last leg of the journey to Falmer holding us up. We even bumped into some other football supporters on our short London underground journey. They’d travelled from Teesside to watch a lower league game at Millwall and they boarded with some police officers. They’d travelled down with them and were doing some filming. I reckon they probably got more footage in that short underground journey than they probably would with a montage of Patrick Bamford goals. I have to say, I’d hate to be a Brighton fan having to go through that rigmarole every game. There were so many queuing at the station; I don’t think Burnley Manchester Road will have seen that many on months. Still, after spending a few years at the Withdean, you’d put up with anything. The team news had come through as we meandered round the stadium from the station. There was good and not so good news. Matt Lowton was fit and on the bench while Ben Mee was fit and back in to lead out the team. On the flipside, Stephen Ward had been assessed and wouldn’t play against his former club. We understand that he could be out of the reckoning for a number of weeks. That gave Charlie Taylor his first Premier League start. The Amex is not up there in the favourite ground list for me although it is significantly better than it was on our first visit in 2011 when there were huge seatless gaps in the corners and a top tier opposite the main stand that wasn’t available. It’s very plastic in atmosphere but they seem to love all the clap along military band stuff pre-match, particularly Good Old Sussex By The Sea. On the plus side, it is reportedly one of the finest of English stadia in the way it caters for disabled supporters, something so many other clubs could learn from. It was good to be among a Burnley contingent of over 1,400. That was the biggest travelling support we’ve had since the defeat at Manchester City and it was virtually standing room only in the away section. We attacked that end in the first half and we certainly looked the brighter of the two sides in the opening exchanges. We forced a double save from their goalkeeper Mat Ryan, who won the man of the match award in the stadium, and then he had to save down to his left to deny us when a Jόhann Berg Guðmundsson shot took a slight deflection. It was all looking good but, alas, it didn’t last and Brighton went on to dominate much of the rest of the first half and I think we could think ourselves somewhat fortunate to have gone in level when referee Chris Kavanagh blew his half time whistle. It wasn’t without controversy either although there was nothing controversial when Anthony Knockaert saw an effort come back off the post or when Phil Bardsley brilliantly headed a shot off the line. But there was more than a hint of debate when Kavanagh pointed to the penalty spot when James Tarkowski was adjudged to have brought down Glenn Murray. Adjudged? The simple answer is, he didn’t. There was no foul, the better placed assistant saw nothing wrong in it and I’m sure the only people in the stadium who thought the decision was correct were the referee himself and Chris Hughton who laughingly suggested after the match that the decision was correct. He must have been taking some Talking Garbage lessons from the likes of Arsène Wenger and Mark Hughes. The Up the Clarets editor was concerned when the ball was placed on the spot with Murray set to take it. “He doesn’t miss penalties,” I said. Murray proceeded to blaze it high over the bar. I’d forgotten that, in 2006, we’d loaned Gifton Noel-Williams to Brighton and hadn’t realised he’d left his mark with his experience of penalty taking. The two players were involved in another incident later in the half. Kavanagh clearly saw it and opted to take no action as, shall we say, Tarkowski’s arm made contact with Murray. At its very worst, he could have been yellow carded. Overall though, some relief at half time that we were level but we were to see a very different football match in the second half. It didn’t seem so at first. Early in the half, we gave the ball away and in a swift counter attack, Knockaert got clear down the right. I thought his shot had deceived Nick Pope but he must have got the slightest of touches though with a corner being awarded. 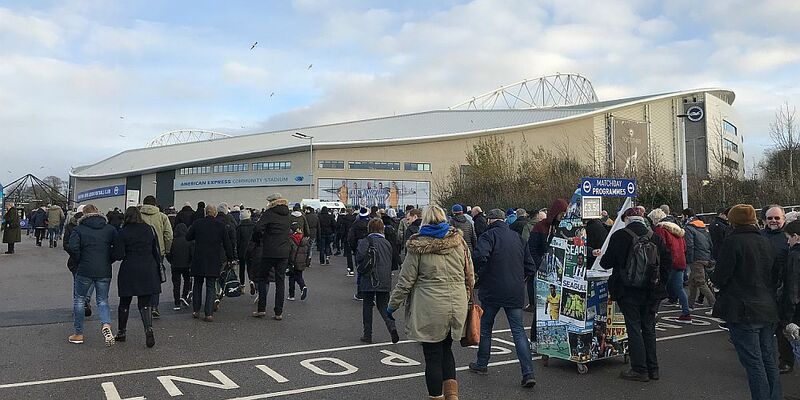 But at no stage again did I think we ever looked in any danger of conceding a goal until, perhaps, the last few frantic minutes when they threw caution to the wind, and by the final whistle it was, I’m sure, Brighton who thought themselves the more fortunate to have won a point. This time it was Brighton with the goal line clearance while once more they got the benefit of a decision, this time the assistant’s flag going up when Chris Wood scored. This time though, the decision was absolutely the correct one. Guðmundsson played the ball into Jeff Hendrick on the right and the Irish midfield, and I have to say I do not understand any criticism of him after his performance in this game, pushed it forward to Scott Arfield. Twice Ryan saved from him and then Wood turned in the second rebound off the goalkeeper. He looked onside to me, and he was, but Arfield had strayed offside when Hendrick played him in. The same assistant, who had also quite rightly not flagged for the penalty, got it right again soon after. Ashley Barnes, who had just come on as a substitute, played in Wood who looked as though he could be some way offside. He wasn’t, the flag rightly stayed down, but Wood missed possibly our best chance when the goalkeeper was able to keep out his chipped effort, much to the frustration of Barnes. Embed from Getty ImagesCould we win it? Both Wood and Bardsley saw shots saved while Ashley Barnes all but barged goalkeeper and ball into the net, but, in the end, there was to be no goal, and with us sound defensively there looked no chance for much of the half of us conceding a goal and so it ended all square at 0-0 and moved us on a bit further into fifth place and surely all but safe from any relegation fears. This is a good result, make no mistake about it. Any point in this league is good and certainly away from home whether the opposition are Manchester City, if only with this current team, or Swansea, well maybe not Swansea just at the moment. We’ve played better, of that there is no doubt, and I do think we are missing, and will continue to miss, the quality of Robbie Brady. The sooner he’s fit and available again and that is certainly not meant as a criticism of any other player. All we had to do then was get home. We were fine on the trains after the queue at Falmer and this time on the underground we met some Premier League fans from a bit further north, three Geordies who had seen their team lose at Arsenal. They were jealous of our manager and said they couldn’t understand why he can’t get a big job. Steve Bates this morning on Sunday Supplement said that he won’t get a top six job because they all go to foreigners. “He’s got a top six job right now,” Neil Custis replied. All we had to contend with then was a road closure and fog, but eventually this long, long day was over with one more point delivered in this remarkable season. What a time it is to be a Claret – we’ve only got Spurs, Liverpool and the two Manchester clubs in the next four home games with a trip to Old Trafford to add in between on Boxing Day. Would you want it any different? That lower league club whose fans we’d seen were beaten at Millwall. Brighton: Mat Ryan, Bruno Saltor, Lewis Dunk, Shane Duffy, Gaëtan Bong, Anthony Knockaert (José Izquierdo 85), Dale Stephens, Davy Pröpper, Solly March, Pascal Gross (Izzy Brown 73), Glenn Murray (Tomer Hemed 63). Subs not used: Tim Krul, Connor Goldson, Ezequiel Schelotto, Beram Kayal. Yellow Cards: Solly March, Dale Stephens, Lewis Dunk, Shane Duffy. Burnley: Nick Pope, Phil Bardsley, James Tarkowski, Ben Mee, Charlie Taylor, Jόhann Berg Guðmundsson, Steven Defour (Ashley Barnes 68), Jack Cork, Scott Arfield, Jeff Hendrick, Chris Wood (Sam Vokes 81). Subs not used: Anders Lindegaard, Matt Lowton, Kevin Long, Ashley Westwood, Nahki Wells. Yellow Cards: Charlie Taylor, Ashley Barnes. Attendance: 29,921 (including 1,422 Clarets).